Today we traveled north from Tiberias on the Sea of Galilee to Hazor. About the time our bus stopped the rain began. We waited a while, but left the bus as soon as the rain let up. This gave an opportunity to visit the gate, the Canaanite palace, and a few other areas before the rain started again. Finally we left and went on to Dan. There we were able to visit the site with only sprinkles. By this time of the year I had come to expect that major rains (the latter rains, Joel 2:23) would be over, but still delighted to see the rains coming to a land that has suffered drought for a few years. 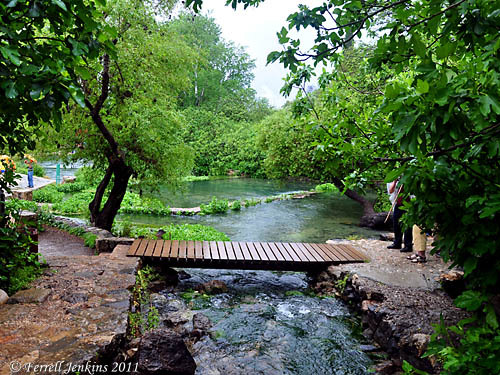 From Dan we continued to Banias, the site of New Testament Caesarea Philippi. This is the area where Peter confessed Jesus to be the Christ, the Son of the Living God, and where Jesus made the promise to build His church. It was still raining some, but I was much impressed with the force of the water today. I have been here on probably every tour since the site has been under Israeli control. I don’t recall ever seeing so much water surging from the earth. This is a good sign, I think. Here is a photo made looking north toward the source of the River Banias, the easternmost source of the Jordan River. Looking to the source of the Banias River. Photo by Ferrell Jenkins. The photo below shows the same area from the north. Here we are immediately above the outlet of the powerful springs. 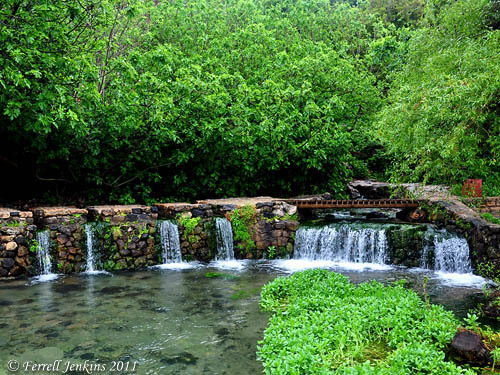 River Banias, a source of the Jordan, from the North. Photo by Ferrell Jenkins. We got only an occasional glimpse of Mount Hermon to see the patches of snow on it. This morning we took our group on the usual boat ride across the Sea of Galilee. We left Tiberias and sailed to near the Cove of the Sower and then turn west to Nof Ginosaur on the western coast of the Sea. Ginosaur is the English Gennesaret. Boat approaches the region of Genesaret. Photo by Ferrell Jenkins. I noticed to significant things about the Sea of Galilee today. It appeared to be higher than the three or four previous times I saw it. Fishing boats were missing when I looked from my room to the Sea this morning. We have come to expect many fishing boats plying the quiet waters, but this has changed since the fishing ban was put into effect. Indeed, the Sea level is higher. We reported December 11, 2009, that the level was 703,12 feet below Mediterranean sea level. In October , 2010, the level had risen to 701.71 feet below sea level. 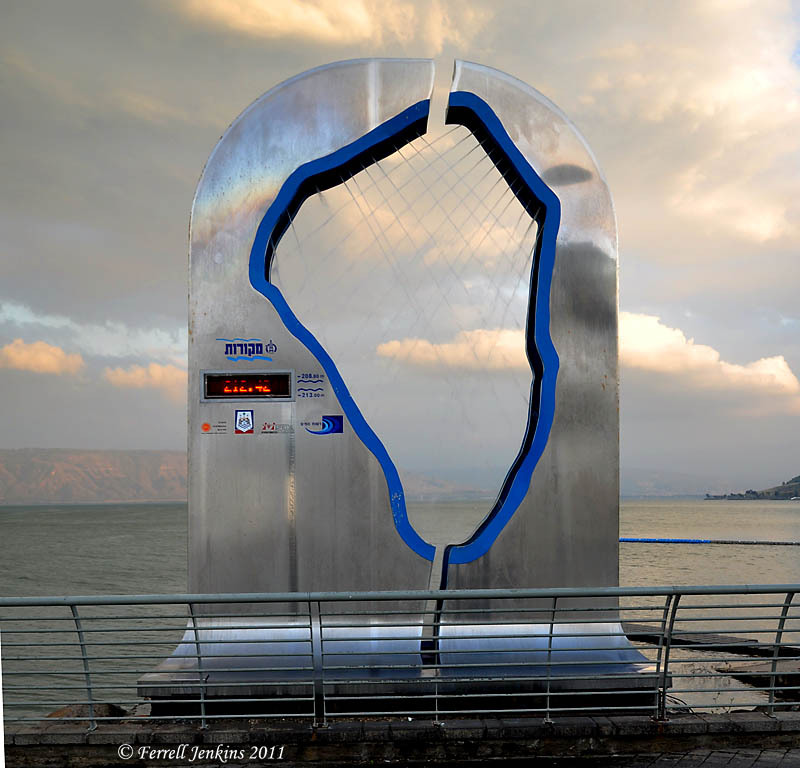 Sea of Galilee gauge, April 29, 2011 shows -212.42. Photo by Ferrell Jenkins. After we returned to the hotel at Tiberias, I walked down to the pier to see the current measurement. The Sea was 212.42 meters below sea level (= 696.916 feet). The rise of the water is significant. The all time low is about 704 feet below sea level. The maximum former level is about 686 feet below sea level. Look carefully and you will see jets of water streaming through the Sea gauge. Yesterday we stopped at Megiddo to look at the model of the city, but due to the rain we decided not to visit the tel. This afternoon we returned. The view of the Jezreel Valley was good. The missing luggage for our two wayward tour members was at the hotel when we returned. We have several tour members from Alabama, Georgia, and Tennessee. Various ones were getting more reports of severe damage in their area back home, but none reported personal injury. For this we are thankful. The prayers of all spiritual persons is appreciated. Everyone in our group is well, and our two delayed tour members arrived early this morning. I am having difficulty with my air card this evening in Tiberias. We had some light rain off and on today. Tonight we are in Tiberias. Regret to hear about the terrible devastation and loss in the southern USA, including some we know personally. Our group arrived in Israel today except for two persons who were delayed due to a bad weather connection in Detroit. Just learned a few minutes ago that they are on their way via Paris. We had time to visit Joppa (Yafo) before proceeding to Netanya, along the Mediterranean coast, for overnight. Joppa is located in the Plain of Sharon and served as the seaport for Jerusalem which is about 35 miles away. The city is now called Jaffa, or Yafo. Joppa was a walled town as early as the reign of Pharaoh Thutmose III (1490-1435 B.C.) who mentions Joppa in his town lists. Here are a few of the biblical highlights for Joppa. Joppa was assigned to the tribe of Dan, but was not controlled by the Israelites till the time of David (Joshua 19:46). Hiram of Tyre floated cedar from Lebanon to Joppa for Solomon’s Temple (2 Chronicles 2:16). 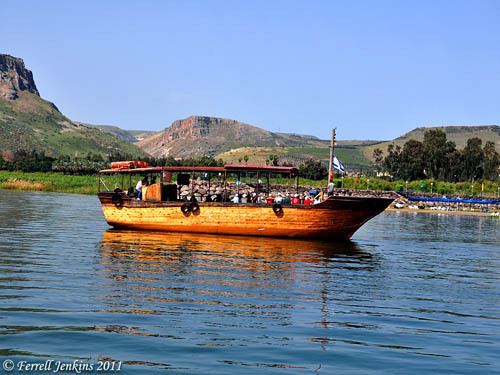 Jonah sought a ship for Tarshish at Joppa to avoid going to Nineveh (Jonah 1:3). Cedars from Lebanon again were floated to Joppa for the rebuilding of the temple (520-516 B.C. ; Ezra 3:7). The port of the city is behind St. Peter’s Church. Tabitha (Dorcas) lived in Joppa. When she died the disciples sent for Peter who was a Lydda. He came to Joppa and raised Dorcas (Acts 9:36-42). (Acts 10:6). Peter stayed many days in Joppa with Simon the tanner (Acts 9:43). His house was by the sea (Acts 10:6). A house near the port is shown as the house of Simon, but there is no way to know this with certainty. Peter received the housetop vision and learned that he was to go to Caesarea to preach the gospel to the Gentiles at the house of the Roman centurion Cornelius (Acts 10:23). 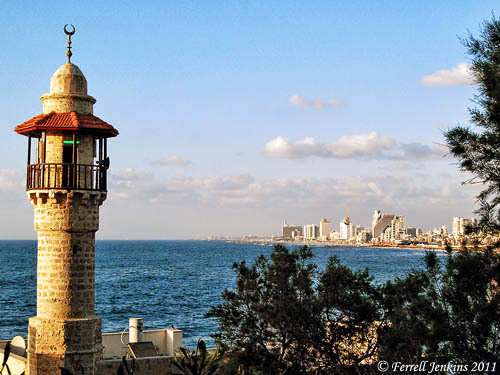 The photo below shows the view of modern Tel Aviv from Joppa. The minaret in the foreground dates to the Turkish period. View of modern Tel Aviv from Joppa. Photo by Ferrell Jenkins. Last year we wrote about The Empty Tomb here, and used a photo of a tomb with a rolling stone. Our photo today is of the same tomb, but it is a different photo which we thought might be useful to those teaching on the resurrection of Christ. This tomb was uncovered during road work at the foot of Mount Carmel near the Jezreel Valley. Roman period tomb with a rolling stone. Photo by Ferrell Jenkins. A larger image, suitable for use in teaching presentations, is available by clicking on the photo above. If we consider the Gospel of John a sort of “Day Planner” for Jesus, we have nearly complete activity recorded for two weeks of the earthly ministry of Jesus. The first is in John 1:19—2:11 where activity for six of the seven days is recorded. I think the omitted day is the sabbath. The next nearly complete week is the last week, leading up to the resurrection. 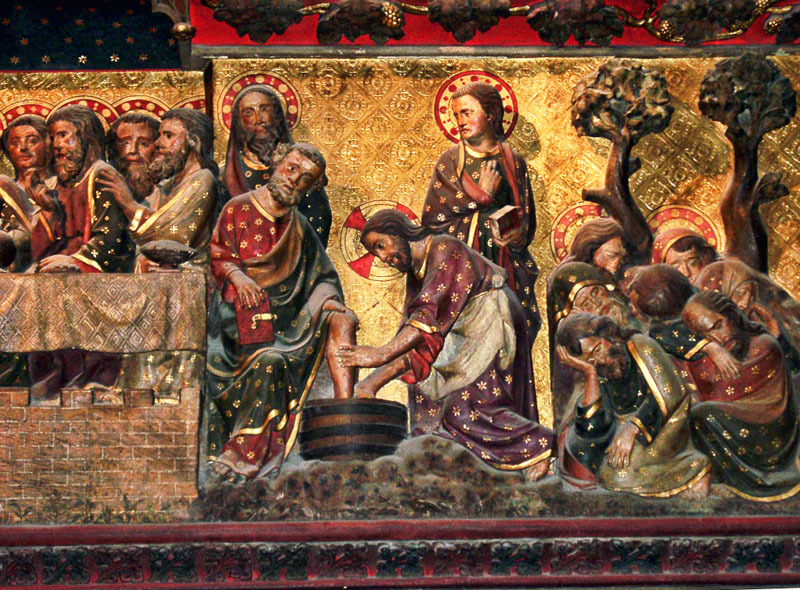 John gives more attention to the last week than any other Gospel. Even here we have activities for only six of eight days. This section begins in John 12:1 and continues into John 20. Here is the way I have reconstructed it. Where John does not record the activity I have omitted the scripture reference. It should be noted that the appearance before Annas and Caiaphas were the Jewish (Religious) trials. The appearance before Pilate [and Herod Antipas] were the Roman (Civil) trials. John does not record the pronouncement of woes on the religious leaders, the institution of the Lord’s Supper, and the account of the agony in the Garden of Gethsemane. Wood carving of Last Week of Jesus in Notre Dame. Photo by Ferrell Jenkins.